2 Car Garage Plans - Size Does Matter! 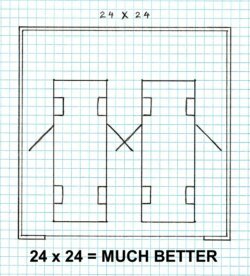 Are 24 x 24 Garage Plans Big Enough? Since the 1970s or so, 2 car garage plans have been included in the majority of new middle class houses built. Why? Most families have two drivers and (at least) two cars. Never mind that a large number of households fill the space with other things and don't have room to park their cars inside! Two car garages have become the standard. Two car garage plans are also the most popular size for a detached design. A single car design usually just isn't large enough, and a 3 car design is more than many people need or have room for, especially if they have an outdoor storage shed for garden tools and lawnmowers. There have probably been more two car garages built than any other design. A single car design is usually not large enough for an overhead loft to be very useful. 2 car garage plans have the advantage of being large enough to include a good size loft. A loft adds considerable expense, but if you can use the space it is definitely worthwhile. 2 car garage loft plans are very popular, and you will see lots of them during your search. 2 car garage plans are very versatile. If large enough, they give you the flexibility of parking vehicles inside and still having room for a workshop or for storage of bicycles and lawn equipment. It is common for two car garages to do "double duty" as a place to park and/or work on vehicles, as well as being home to woodworking, fitness and recreational equipment. 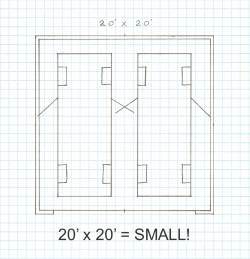 The smallest two car garage plans that are practical come in at 20' x 20'. Any smaller than that makes it nearly impossible to open the car doors without hitting the wall or another vehicle. If you park two cars inside, this size does not give you any extra room for storage. It will be difficult to get two average size vehicles in and still have room to walk around them. This size is useful though if you only need to park one vehicle inside, and want to use the rest of the space as a workshop or for storage. The sketch shows a 16' wide door, with only 3 feet between the cars - look at how close the cars are to the edge of the door! It wouldn't be quite as bad with smaller cars, but it would be even worse if you own a large SUV or full size truck. 24 x 24 garage plans are much more versatile. This is the most popular size for detached two car garage plans. 24' x 24' is large enough to comfortably fit two average-sized cars and still have a little space for storage or a small workshop area. It is still a little tight though if you are parking two larger vehicles (such as a full size truck or SUV) inside. If you are using the space for automotive restoration or repair work on anything other than small vehicles, you will likely find the 24 x 24 size to still be cramped. With 2 cars inside, it gives you little room for walking around an open car door. It also is difficult to make room for maneuvering an engine hoist, or even for using a full-size floor jack. By the time you add your tool boxes, a workbench, shelving or cabinets, plus a few larger tools (drill press, hydraulic press, welder, parts washer, etc. ), there isn't much elbow room left! I recommend at least 28' x 28' for automotive restoration or repair work, but a 30' x 30' 2 car garage plan is even better. This gives you enough space to have some of your tools and equipment lining the walls, and still have room to move around and open the car doors. However, 24 x 24 garage plans are adequate in most cases for most people. If you are working on smaller vehicles, motorcycles, ATVs, or using it as a woodworking shop, the standard 24 x 24 garage plans can work very well. If you are considering building a detached 2 car design, there are some free 2 car garage plans that are worth a look. TodaysPlans.com has several different sets of free designs available for download. These blueprints include a loft and are designed so that extra bays can be added later. They also have a really nice package of 58 plans for only $29. At fifty cents per plan, it's a steal! I have purchased this package, and you can find out more details about it on my Detached Garage Plans page. 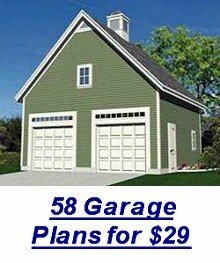 CADNW.com offers a set of free two car garage building plans on their website. This set of 24 x 24 garage designs includes a loft, and the blueprints have a good amount of detail. WesternConstructionInc.com has three different sets of free blueprints available on their blog page at the time of this writing. One is a single story with regular trusses, one is a single story with a storage loft, and the third is a 1-1/2 story with dormers on both sides. There are others available, but these are more complete and detailed than most that I have found. 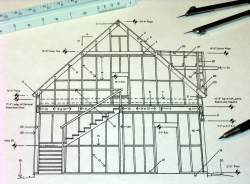 If you are interested in seeing more, take a look at our separate pages on Free Garage Plans and Free Pole Barn Plans. The best advice I can give when looking at 2 car garage plans is to go as big as you can afford or have room for. It will never be "big enough"! Get a plat of your property and check on easements, right of ways, underground utilities, setback requirements, and any other local restrictions. I always suggest making a simple sketch on graph paper of the size you have in mind, and then sketching in all the things you need space for. This is the best way to make sure the 2 car garage plans you are looking at will suit your needs. For a list of the best places online to find 2 car garage plans, take a look at our Garage Blueprints Directory. You will find links to websites that have the largest variety of designs available, with a quick summary of what they have to offer. You may also want to check out our Related Pages for information on other sizes. There are literally thousands of different designs out there, and 2 car garage plans are the most popular.